Classical music lovers are, let's admit it, a minority group within the general population. We balletomanes form, sadly, an even smaller minority within it and, as such a beleaguered species, often find it difficult to counter some of the widespread popular misconceptions about ballet. There's the idea, for instance, based on both gender stereotyping and an entirely superficial consideration of classical technique in particular, that male dancers are enervated and effete - an error that blithely ignores the degree of physical strength and stamina that's a prerequisite for a successful career. Meanwhile, when it comes to the music, the man in the street is content to believe that ballet begins and ends with Tchaikovsky. Even quite knowledgable music lovers can, however, often labour under a third misconception. Because their interest is less in the dancing per se than in the musical score that accompanies it, they regard the latter as the most important element in a ballet. Now, when considering contemporary dance in particular, it's true that the score can be the central starting point. Perhaps because of its artistic merit, or its rhythms suitable for dancers or maybe even because it's simply less expensive than commissioning a brand new work, today's choreographers will often fashion their creations to fit an existing piece of music. Thus, to choose a pretty random example, last year I reviewed a performance set to Beethoven's 9th symphony (review). In the 19th century heyday of classical ballet, however, the boot was very much on the other foot. The very first stage of creating any new ballet involved the choreographer dissecting the storyline and specifying his exact requirements, dance number by number, minute by minute and musical bar by musical bar. Only then, with everything scrupulously detailed on paper, was a composer commissioned to create the melodies that fitted that structure already laid down with minutely detailed precision by the choreographer - who thus became the ballet's true auteur. When Tchaikovsky, for instance, came to write his music he had already been absolutely constrained by the exactly detailed requirements of ballet master Marius Petipa; Petipa did not choreograph his masterpieces to the music of the composer. Tchaikovsky, however, alone amongst 19the century ballet composers, rose almost naturally and unconsciously above those practical limitations. That explains the initially negative critical and popular response to his ambitious first score, Swan lake, in that it failed to accommodate itself to the narrowly focused expectations of choreographers, dancers and audiences alike. But that also, together with Tchaikovsky's consistent genius for melody, explains why its score has gone on to attain the iconic status it possesses today. Much of the second half of the 19th century has been described, as recording producer Anders Wiklund's informative booklet notes point out, as a "black hole" in the history of ballet in Sweden when dancers more typically appeared on stage during interpolated interludes in opera. The disc under review usefully retrieves from that murky oblivion two little-known Swedish ballet scores written right in the middle of the period - at just about the same time, in fact, that Tchaikovsky was working on Swan lake. An adventure in Scotland and A dream - together with a third, even more ambitious, production Melusina (1882) - marked a brief and ultimately unsuccessful attempt in Stockholm to popularise large-scale and longer stand-alone ballets written by native composers. The fact that they are largely forgotten nowadays need not, however, be regarded as an indication of irredeemable mediocrity. Most 19th century ballet was an ephemeral art form where composers were aiming to do little more than play the commercial game and entertain the groundlings. They were not, as far as we can tell, writing with any eye to posterity. Indeed, in most cases no-one even thought it worth creating or preserving full orchestral scores after a new production had come to the end of its run: Giselle itself, for example, only existed in a piano score and its orchestral parts until a full edition was prepared from those as late as 1924. Nonetheless, if Messrs. Hallström and Nordqvist were not aiming necessarily high, in these two agreeably tuneful scores they come commendably close to scoring an artistic bull’s-eye. Thanks to having had just one composer and to the fact that its storyline is confined to a single Act, A dream is the more stylistically homogeneous of the two ballets. 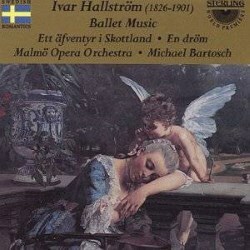 Hallström was not only somewhat older than Nordqvist but self-educated - and, possibly as a result, more cautious and conservative - as a musician. His models, as demonstrated not just here but also in several of his somewhat better-known light operas, are French and of a decade or two earlier, with, at various points, Adam, Auber and Delibes coming to mind. Nordqvist, on the other hand, not only a younger man but one with the benefit of an academic musical education, seems to have had an ear more sympathetic to slightly more contemporary trends - even though I suspect that Mr Wiklund is knowingly over-egging the pudding when he suggests that the pas de deux for the second Act of An adventure in Scotland is an "almost Tchaikovskian" creation. The differences in style between Hallström and Nordqvist are apparent as you listen to An adventure - which, by the way, is so replete with Scotch snaps and other musical clichés that it could hardly hail from anywhere other than north of the border. Each man contributed seven numbers to the score, though the distribution is a little odd. When, in a rather better-known collaboration from a decade earlier, Ludwig Minkus and Léo Delibes had worked on La source (1866), they each wrote one complete Act and one complete Scene, thereby preserving the uncompromised musical integrity of their respective contributions. Hallström and Nordqvist, on the other hand, freely intermixed numbers within each of the two Acts. Maybe they each chose the particular numbers that personally appealed to them or that they thought suited their own talents? Or maybe they wanted to avoid the stylistically jarring juxtaposition - and the potential opportunity for critical comparison - of two individually-written Acts? The Minkus/Delibes collaboration had resulted, after all, in a damning critical response to the Austrian composer's Act when heard alongside the Frenchman's. In light of that precedent, perhaps Hallström and Nordqvist - who were also, it appears, close personal friends - decided that it was better to sink or swim together rather than risk the reputation of either one of them separately? Whatever the case, the two ballets are presented here to the best possible effect. The Malmö Opera Orchestra is a relatively new band, having been founded as recently as 1991, but its musicians, under the idiomatic direction of Michael Bartosch, sound utterly at home with these long-forgotten scores. They are presented, too, in clear, finely engineered sound. Anyone who enjoys 19th century ballet will certainly enjoy listening to this generously timed CD. I return, though, to my earlier point. Ballets of that era were driven by their choreography, to which the music was essentially subordinated. It follows that, even if these two scores themselves are essentially lightweight and inconsequential, we will only be able to make a fair assessment of their value if we can see - note that word! - how effective they are in supporting the on-stage action. If, indeed, A dream and An adventure in Scotland are as significant in Swedish ballet history as Mr Wiklund's booklet notes suggest, is it too much to hope that one day the Royal Swedish Ballet might give them - and, come to that, their stablemate Melusina - a modern revival?